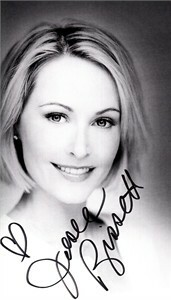 Roughly 5 by 9 inch black and white portrait photo (printed on plain paper) autographed in black marker by actress Josie Bissett (Melrose Place, Secret Life of the American Teenager, etc). Obtained in person. With certificate of authenticity from AutographsForSale.com. ONLY ONE AVAILABLE FOR SALE.